Teeth whitening does not damage your teeth. The whitening process uses active ingredients to temporarily open pores in your teeth and lift stains. After each whitening session, your teeth naturally remineralize and rehydrate. Sensitivity after teeth whitening is normal. 60% of us have naturally sensitive teeth, most often caused by genetics, thin enamel, or crack/damaged teeth. During the whitening process, it is completely normal for teeth sensitivity to occur. The teeth become temporarily dehydrated which reduces their ability to insulate the nerve from changes in temperature. Sensitivity will disappear 12-36 hours after whitening. The best time to whiten your teeth is just before bed. 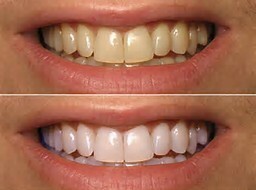 Immediately after whitening your teeth are more susceptible to restaining. The pores in your teeth are slightly more open and can more easily allow stains in. We recommend whitening before bed as it reduces the opportunity for staining and gives your teeth the night for rehydrating and remineralizing. Are you looking to add some activities to your schedule? Kirby Centre can help with that. Grocery Delivery services in Calgary, because sometimes the weather doesn’t allow you to get out……. The only way to secure a complete lower denture is with Implants.